First of all, thanks for inviting me to join this Blog. I am so glad to have finally joined the Rose City Romance Writers. It’s a great feeling to know that there is a world of women out there with a passion that drives them as intensely as it does me: writing about love. 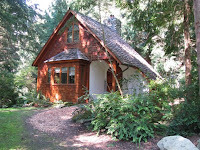 If you are a female writer who dreams of going somewhere beautiful and having uninterrupted time to just write and lose yourself inside your creative world, I have a holy place to share with you: Hedgebrook. I applied for a residency about four years ago and was awarded three blissful weeks to work on my project at that time—a memoir about my crazy years spent in Hollywood as a (ahem) stripper. Although I still haven’t finished that project, (some things just take a while to digest), I had an amazing Hedgebrook experience that I couldn’t let go from my mind. Since that stay four years ago, I’ve had a daughter, who has finally reached an age where she is old enough to eagerly stay with Grandma. I was finally able to return this spring for another week of writing heaven. 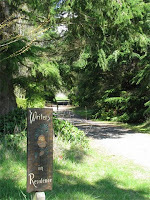 Hedgebrook is a rural retreat for women writers on Whidbey Island, in Washington. Six writers at a time stay, and they are usually from all over the world. 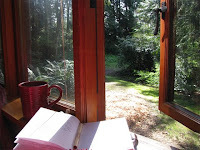 Each writer gets her own a-frame cabin, heated by a wood stove. The cabins are nestled on the wooded multi-acred lot, close enough to the other cabins to not feel isolated, but far enough from the others to ensure complete privacy. There are trails and paths that lead to all sorts of inspirational look-outs: ponds, waterfalls, views of the nearby beach. All meals are prepared for you by an amazing Chef named Jesse who uses only local, farm-raised, and fresh-from-the-garden foods. Your time at Hedgebrook is your own, with the exception for your dinner each night, and that you spend in the company of other writers at the farmhouse. 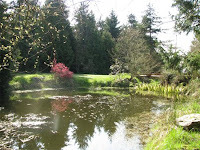 The best thing about Hedgebrook is that it is non-profit and there is no price for your stay. Not that I haven’t vowed to tithe them each time I receive a royalty check for one of my books. It’s become a sacred place for me to write and I feel I must share this information with all my writer friends, because there is no place like this. Women have so many responsibilities these days, and we also face so many challenges in feeling truly safe in this world—safe enough to hear our deepest, truest voices emerge. My last stay at Hedgebrook was very emotional for me, and I made breakthroughs I do not think I could have achieved anywhere else. Just being in solitude in nature, listening to the owls at night from the upstairs loft of my cabin, walking to the beach in the mornings with my journal, all the while knowing that the time was completely my own, and that I was safe and cared for, was a romance in and of itself. This place does sound like heaven, Megan. I’ve just printed up my application. ~smile~ Sometimes, I just want to turn the world off, even for a few moments. This sounds like the place to do it. Thanks for sharing! I am SO going there! Thank you for sharing pictures Megan!!! I had pictured what it looked like but man….beautiful and inspirational! What a wonderful idea, Megan! Such a beautiful place, with such perfect solitude, would be a real blessing to one’s writing, I’m sure! Thanks for sharing this wonderful place. With all the demands on our time, it sounds like the perfect place! Wow. Thanks for sharing that, Megan. It sounds amazing. I’m taking a second look at the green couch (where I write my books) and thinking I need an upgrade!